The late Zecharia Sitchin was close to 90 years old when this final book was published; a remarkable accomplishment. His work expanded greatly over the decades, and this book provides something of a summation of the entire oeuvre, with some new material provided towards the end. "There Were Giants Upon the Earth" thus provides a substantive overview of what is essentially a completely alternative paradigm about human origins and history. Sitchin starts with Alexander - an almost modern figure given his usual ancient references. Alexander's interest in immortality and the gods seems to provide a bridge between us and the ancient world. 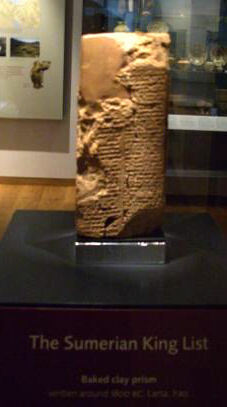 From there we plunge back in time, using the King Lists of Manetho and the land of Sumer for reference (see my photo, right, of the Sumerian King List kept in the Ashmolean Museum, Oxford). The ancient lists boldly assert the dominion of demigods and gods going back some 432,000 years, leading Sitchin to place the arrival of the Anunnaki on Earth to a point some 445,000 years ago. These Anunnaki - the ancient astronauts from the planet Nibiru - forged us in their image and dwelt among humanity as gods (with a small 'g'). Each ancient civilisation knew them, although the names and tales varied with the times. But these gods were interchangeable across the pantheons of the ancients - myth to most of us now, but once present as real flesh-and-blood beings in Sitchin's paradigm. These gods eventually intermingled with their human subjects to such an extent that demigods were born - who also played important roles in the mythology and chronologies of the ancient world. Sitchin explores these connections in great detail in this book, and weaves a complex but plausible picture. The Earthborn generations of Anunnaki aged quicker than their Nibiru-born parents, who aged quicker than those of their race that remained on the mother world. Hence the decreasing life-spans of the Biblical Patriarchs, whose provenance may have been connected with the Anunnaki. These considerations become important towards the end of the book as Sitchin looks closely at the lineage of various historical figures in Sumer. If his theories are correct, then we would expect that the royal lines of the Sumerian city states would be closely interwoven with the gods associated with the cities. This leads Sitchin to some daring conclusions: Human remains found when tombs in Iraq were excavated during the early parts of the last century might hold clues to our common ancestry. Significantly, those remains are at hand - preserved and kept by the curators of the National History Museum. 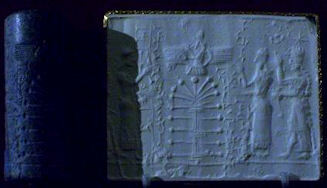 It is Sitchin's express wish that the remains of Queen Nin-Puabi should be subjected to DNA testing. He is confident that the code will prove to be Anunnaki. 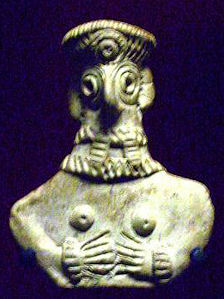 Nin-Puabi is not just a queen, he asserts - she is an Anunnaki goddess! That startling revelation will surely remain an open question. The curators of museum antiquities are not likely to excitedly pursue genetic testing on behalf of a maverick researcher, let's face it. Not unless they were VERY confident that he was wrong. Anyway, they can't complain that Sitchin wasn't willing to put his theories to the test! I include some correspondence from a curator at the museum on this topic on my British Museum Evidence page. On another note, this book contains a section that is directly pertinent to my Dark Star revisionism. Well, yes, they would. There really is no getting around that - besides bringing in a Dark Star. Nevertheless, Sitchin does try to address this problem in a different way. "My answer has been that we and life on Earth face the same issue even though Earth is at a presumed "liveable distance" from the Sun; all we have to do is leave Earth's surface a little bit, and we'll freeze to death. Earth, like other planets, has a nuclear core that produces heat - it gets warmer and warmer as miners tunnel down. But our very thick rocky mantle makes us dependent on heat coming from the Sun. What protects us is Earth's atmosphere. Acting as a greenhouse, it keeps in the warmth we get from the Sun. After 11 years, Sitchin and I are no closer on this thorny issue. If you shifted the Earth to the outer solar system, its entire atmosphere would quickly freeze out to form a thick icy crust on the surface of our world. No atmosphere would remain at all. That's just how it is. Yes, the Saturnian moon Enceladus has surprised us all by retaining liquid water. But it is internally heated by its proximity to its massive parent world (Saturn). The internal tidal forces are directly a result of the gravitational field Enceladus finds itself in. Nibiru needs such an interaction, too. More so, in fact, because its distance from the Sun is so much greater. It saddens me that I have failed to get this essential point across effectively. The presence of a Dark Star is required for Sitchin's entire paradigm to work. The science, I'm afraid, is very much on my side. Despite this on-going issue, this book provides an excellent summation of the world according to Sitchin - it is a fascinating read for anyone wishing to explore an completely alternative paradigm. 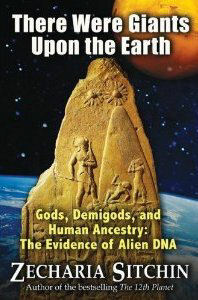 Subtitled "Gods, Demigods, and Human Ancestry: The Evidence of Alien DNA"